I was missing several adult teeth. A lot of the time I would find myself in pictures, I didn’t even realize I was doing it, I was keeping my mouth closed. I think I subconsciously was a little bit embarrassed about it. I actually hopped from dentist to dentist trying to find one that would have a solution that didn’t just involve wait and see or extensive surgeries that didn’t make sense to me. And then I went and saw Dr. Rye and we had a whole plan. I just felt comfortable moving forward. Quickly implants came in. Right after the implants there were temporary veneers and implant crowns. Next thing I knew, I had my permanents in. And the work paid off. Now, you see pictures of me and I’m always smiling, full teeth, laughing. I just had wedding photos done, and they’re great photos of a great smile. Thank you and your whole team, Dr Rye! Mary had been through years of orthodontic treatment, but her final bite was never satisfactory. She had some missing teeth and retained baby teeth, and a crossbite which she wanted to correct to be more aesthetically pleasing. Mary could not close her back teeth together comfortably, and she was developing popping and clicking noises in her tempero-mandibular joints (“TMJ”). 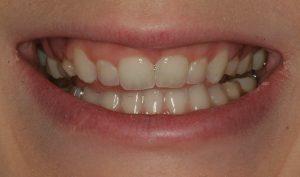 She had considered going back into braces to close the gaps left by the retained baby teeth. We began Mary’s treatment with painless gum recontouring. When the gums had healed, her baby teeth were extracted, implants were placed, and beautiful porcelain crowns were placed on the implants. Mary’s treatment was completed within nine months. 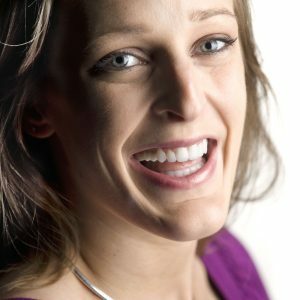 Mary can now, for the first time in her life, put her teeth together into a consistently comfortable, painless bite, without symptoms of “TMJ”. Mary receives many compliments on her absolutely gorgeous new smile, sometimes even from people she has only recently met.